Sudden cardiac death (SCD) in a young person is a rare but tragic occurrence. The impact is widespread, particularly in the modern era of media coverage and visibility of social media. Hypertrophic cardiomyopathy (HCM) is reported historically as the most common cause of SCD in athletes younger than 35 years of age. A diagnosis of HCM may be challenging in athletes as pathological hypertrophy of the left ventricle may also mimic physiological left ventricular hypertrophy (LVH) in response to exercise. Differentiation of physiological LVH from HCM requires an array of clinical tools that rely on detecting subtle features of disease in a supposedly healthy person who represents the segment of society with the highest functional capacity. Most studies are based on comparisons of clinical tests between healthy unaffected athletes and sedentary individuals with HCM. However, data are emerging that report the clinical features of athletes with HCM. This article focuses on studies that help shed further light to aid the clinical differentiation of physiological LVH from HCM. This distinction is particularly important in a young person: a diagnosis of HCM has significant ramifications on participation in competitive sport, yet an erroneous diagnosis of physiological adaptation in a young athlete with HCM may subject them to an increased risk of SCD. Aneil Malhotra, Cardiology Clinical and Academic Group, St George’s, University of London, Cranmer Terrace, London SW17 0RE, UK. Athletes who perform regular and intensive exercise regimes develop a variety of electrical and structural cardiac adaptations that manifest functionally to improve stroke volume and performance. Up to one-fifth of young athletes (aged between 14–35 years) reveal greater left ventricular (LV) wall thickness compared to sedentary controls, though the majority fall under 12 mm.1,2 A small proportion of athletes, however, reveal an LV wall thickness of 13–16 mm, which overlaps with morphologically mild hypertrophic cardiomyopathy (HCM). Hypertrophic cardiomyopathy is traditionally viewed as the most common condition responsible for sudden cardiac death (SCD) in young athletes.2–4 In a large case series of SCD in 1,866 young athletes, HCM was the causative condition identified in nearly 40 % of cases.4 Nearly two-thirds of athletes were 17 years old or younger and still at high school. Studies have also revealed a strong male preponderance for SCD, particularly in African American athletes who compete in sports with sudden movements and adrenergic surges such as football or basketball.5 Unfortunately over 80 % of affected individuals are asymptomatic before SCD, which often occurs during exercise or in its aftermath. A small proportion (2 %) of athletes who are white, male and compete in endurance sports have been reported to demonstrate LVH between 13 and 15 mm, which can also mimic morphologically mild HCM.2,3 Further studies revealed that ethnicity affects the degree of LVH, with up to 18 % of African American adult athletes exhibiting an LV wall thickness of >12 mm but never beyond 16 mm.10 The ‘grey zone’ is therefore larger in African American athletes. Rather than relying on conventional methods to differentiate physiological LVH from HCM,14,15 recent studies have focused on direct comparisons between athletes with HCM and those with physiological LVH16,17 to provide a better understanding of the clinical features of HCM in an athlete (Figure 1). A wide array of clinical tools are available to create diagnostic algorithms to facilitate such differentiation,18 including clinical symptoms and family history, ECG, echocardiography and cardiac MRI (CMR), exercise stress testing and genetic testing. Abnormal T wave inversion (TWI) is the hallmark of HCM and observed in over three-quarters of athletes with the condition according to a recent study.19 In another recent study TWI was more common among 106 athletes with HCM compared to 101 sedentary individuals with HCM (96 % versus 84 %, p=0.003)16 with the lateral leads most frequently involved. ST segment depression was observed in over half of athletes with HCM and one-quarter demonstrated pathological Q waves. Additionally, in a subgroup of 55 healthy athletes with physiological LVH, abnormal TWI, ST segment depression or pathological Q waves were absent in everyone. A symmetrical increase in LV wall thickness in a homogenous pattern is seen in athletes with physiological LVH. Conversely in HCM, irregular patterns of hypertrophy occur that are localised to the septum or apex in an asymmetrical manner. Athletes with HCM exhibit less LVH than sedentary individuals with HCM (15.8 mm versus 19.7 mm, p<0.001) with a third demonstrating hypertrophy confined to the LV apex.16 The traditional ‘grey zone’ would only include 14 % of athletes with HCM who demonstrated mild concentric LVH that could also be interpreted as physiological LVH. Systolic anterior motion (SAM) of the mitral valve against the inter-ventricular septum causing dynamic LVOTO is present in approximately 25 % of sedentary HCM individuals and up to 70 % of cases during exercise.13 Athletes with HCM do not usually reveal baseline or dynamic LVOTO. Myofibre disarray in HCM, coupled with impaired sarcoplasmic calcium kinetics leads to reduced myocardial relaxation and diastolic dysfunction. Most athletes with HCM, however, demonstrate normal diastolic function according to conventional parameters.17 Using E prime 9 cm/s as a cut-off for pathology according to British Society of Echocardiogram guidelines22 revealed a sensitivity of only 35 % among 56 athletes, 37 of whom were diagnosed with HCM, with the remaining 19 athletes having physiological LVH. The sensitivity fell further to 14 % when using an E/E prime ratio >12 as a marker of pathology. The highest sensitivity for identifying HCM in the athlete was found using longitudinal function as a discriminating marker (S prime <9 cm/s) albeit at 43 % with a specificity of 84 %. Assessment of global longitudinal strain (GLS) has also been shown to be useful with a measurement of more (negative) than −10 % resulting in a sensitivity of 87 % and specificity of 95 % for the diagnosis of HCM in a sedentary patient.23 A GLS of more than −15% in an athlete is deemed pathological. Cardiac MRI is the gold standard imaging tool for assessment of HCM in athletes and non-athletes. The ability to delineate LV hypertrophy, reveal underlying fibrosis or utilize more novel techniques such as T1 mapping give CMR a unique position in the armamentarium of imaging modalities. When comparing athletes with HCM to sedentary affected individuals, there is no discernible difference in the presence of myocardial fibrosis (33 % versus 40.6 %, p=0.258).16 Athletes with HCM, however, could have a lower ischaemic burden in the absence of mechanical LVOTO, severe LVH and microcirculatory disease. An attenuation of or drop in blood pressure response during exercise is noted in nearly one-quarter of patients with HCM. Plausible mechanisms are abnormal vascular tone, small vessel ischaemia or exertional LVOTO.25 ECG markers of pathology may also be noted during exercise and include ST segment depression, TWI or ventricular arrhythmias. Athletes with physiological LVH, particularly those participating in endurance sports, demonstrate the greatest LV cavity size causing enhanced diastolic filling and subsequent generation of large stroke volume. A VO2 max of >50 ml/kg per min, or >120 % of age-predicted value has traditionally been used to differentiate physiological LVH from HCM.26 However, there are certain limitations regarding the widespread applicability of this value given that the cut-off was based primarily on white male athletes. VO2 max variations are lacking for both African American athletes who are competing in increasing numbers at every level of sport internationally and also athletes with HCM. The overarching aim of managing athletes with HCM is to mitigate their risk of developing potential sequelae of the condition, including SCD. Coupled with the heterogeneous clinical course of the condition making such sequelae difficult to predict, any form of exercise prescription therefore errs on the side of caution. Both the American (AHA/ACC) and European (ESC) recommendations prohibit competitive sports with medium to high dynamic/static components.29,30 This encompasses many mainstream sports with competitive participation limited to low dynamic and low static sports such as bowling and golf. Evolution in the field of molecular genetics has led to an increasing number of asymptomatic individuals detected through familial screening. Many do not, however, reveal any phenotypic features of HCM and in such genotype positive/phenotype negative individuals, the exercise recommendations vary between the USA and Europe. ESC recommendations adopt a more conservative attitude on the grounds that a genetic predisposition may promote arrhythmogenesis even in the absence of LVH. This approach has been supported by imaging studies that have demonstrated mild impairment of myocardial relaxation and an increase, albeit modest, in the extracellular cardiac matrix in genotype positive/phenotype negative patients.31,32 Conversely, US studies in adolescents who were genotype positive/phenotype negative have revealed a low penetrance of disease over a 12-year follow-up period with only 2 of 36 (6 %) patients affected.33 As such, the USA permits participation in all sports for these individuals, including those with high dynamic and high static components, though it advocates regular surveillance. Hypertrophic cardiomyopathy reduces the functional capacity of an affected person, leading to a physical inability to participate in high-intensity sports. Impaired diastolic function, small LV cavity size, dynamic left ventricular outflow tract obstruction and microcirculatory coronary disease leading to a reduction in subendocardial flow can all cause failure to augment stroke volume during exercise and low peak oxygen consumption. Differentiating physiological LVH from morphologically mild HCM in the athlete is particularly challenging with an array of clinical tools used to aid the clinician to make the correct diagnosis. Maron B. Structural features of the athlete heart as defined by echocardiography. JACC 1986;7:190–203. Pelliccia A, Maron BJ, Spataro A, et al. The upper limit of physiologic cardiac hypertrophy in highly trained elite athletes. N Engl J Med 1991;324:295–301. Basavarajaiah S, Wilson M, Whyte G, et al. Prevalence of hypertrophic cardiomyopathy in highly trained athletes: relevance to pre-participation screening. J Am Coll Cardiol 2008;51:1033–9. Maron BJ, Doerer JJ, Haas TS, et al. Sudden deaths in young competitive athletes: analysis of 1866 deaths in the United States, 1980–2006. Circulation 2009;199:1085–92. Harmon KG, Asif IM, Klossner D, Drezner JA. Incidence of sudden cardiac death in National Collegiate Athletic Association athletes. Circulation 2011;123:1594–1600. Maron BJ, Gohman TE AD. Prevalence of sudden cardiac death during competitive sports activities in Minnesota high school athletes. J Am Coll Cardiol 1998;32:1881–4. Eckart RE, Scoville SL, Campbell CL, et al. Sudden death in young adults: a 25-year review of autopsies in military recruits. Ann Intern Med 2004;141:829–34. Harmon KG, Asif IM, Klossner D DJ. Incidence of sudden cardiac death in national collegiate athletic association athletes. Circulation 2011;123:1594–1600. Corrado D, Basso C, Schiavon M, Pelliccia A, Thiene G. Pre-participation screening of young competitive athletes for prevention of sudden cardiac death. J Am Coll Cardiol 2008;52:1981–9. Sheikh N, Papadakis M, Carre F, et al. Cardiac adaptation to exercise in adolescent athletes of African ethnicity: an emergent elite athletic population. Br J Sports Med 2013;47:585–92. Elliott PM, Anastasakis A, Borger MA, et al. 2014 ESC Guidelines on diagnosis and management of hypertrophic cardiomyopathy: The Task Force for the Diagnosis and Management of Hypertrophic Cardiomyopathy of the European Society of Cardiology (ESC). Eur Heart J 2014;35:1–55. Pelliccia A, Maron BJ, Spataro A, et al. The upper limits of physiologic cardiac hypertrophy in highly trained elite athletes. N Engl J Med 1991;324:295–301. Maron MS, Olivotto I, Zenovich AG, et al. Hypertrophic cardiomyopathy is predominantly a disease of left ventricular outflow tract obstruction. Circulation 2006;114:2232–9. Sharma S, Maron BJ, Whyte G, et al. Physiologic limits of left ventricular hypertrophy in elite junior athletes: relevance to differential diagnosis of athlete’s heart and hypertrophic cardiomyopathy. J Am Coll Cardiol 2002;40:1431–6. Vinereanu D, Florescu N, Sculthorpe N, et al. Differentiation between pathologic and physiologic left ventricular hypertrophy by tissue doppler assessment of long-axis function in patients with hypertrophic cardiomyopathy or systemic hypertension and in athletes. Am J Cardiol 2001;88:53–8. Sheikh N, Papadakis M, Schnell F, et al. 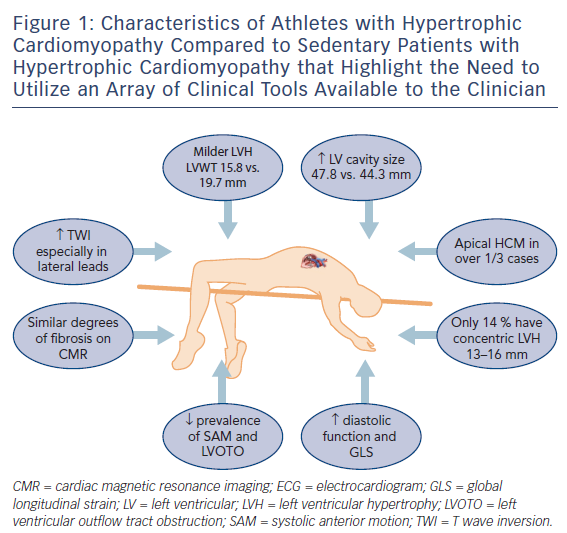 Clinical profile of athletes with hypertrophic cardiomyopathy. Circ Cardiovasc Imaging 2015;8(7):e003454. Malhotra A, Sheikh N, Dhutia H, et al. Differentiating physiological left ventricular hypertrophy from hypertrophic cardiomyopathy in athletes: proposed echocardiographic protocol. Heart 2014;100(Suppl 3):A52. Erickson CC. Discrimination of the “athlete’s heart” from real disease by electrocardiogram and echocardiogram. Cardiol Young 2017;27(Suppl 1):S80–8. Schnell F, Riding N, O’Hanlon R, et al. Recognition and significance of pathological T-wave inversions in athletes. Circulation 2015;131:165–73. Spirito P, Pelliccia A, Proschan MA, et al. Morphology of the “athlete’s heart” assessed by echocardiography in 947 elite athletes representing 27 sports. Am J Cardiol 1994;74:802–6. Caselli S, Maron MS, Urbano-Moral J, et al. Differentiating left ventricular hypertrophy in athletes from that in patients with hypertrophic cardiomyopathy. Am J Cardiol 2014;114:1383–9. Butz T, van Buuren F, Mellwig KP, et al. Two-dimensional strain analysis of the global and regional myocardial function for the differentiation of pathologic and physiologic left ventricular hypertrophy: a study in athletes and in patients with hypertrophic cardiomyopathy. Int J Cardiovasc Imaging 2011;27:91–100. Swoboda PP, McDiarmid AK, Erhayiem B, et al. Assessing myocardial extracellular volume by T1 mapping to distinguish hypertrophic cardiomyopathy from athlete’s heart. J Am Coll Cardiol 2016;67:2189–90. Kawasaki T, Azuma A, Kuribayashi T, et al. Vagal enhancement due to subendocardial ischemia as a cause of abnormal blood pressure response in hypertrophic cardiomyopathy. Int J Cardiol 2008;129:59–64. Sharma S, Elliott PM, Whyte G, et al. Utility of metabolic exercise testing in distinguishing hypertrophic cardiomyopathy from physiologic left ventricular hypertrophy in athletes. 2000;36:864–70. Basavarajaiah S, Wilson M, Junagde S, et al. Physiological left ventricular hypertrophy or hypertrophic cardiomyopathy in an elite adolescent athlete: role of detraining in resolving the clinical dilemma. Br J Sports Med 2006;40:727–9. Pelliccia A. Remodeling of left ventricular hypertrophy in elite athletes after long-term deconditioning. Circulation 2002;105:944–9. Maron BJ, Udelson JE, Bonow RO, et al. Eligibility and disqualification recommendations for competitive athletes with cardiovascular abnormalities: Task Force 3: Hypertrophic Cardiomyopathy, Arrhythmogenic Right Ventricular Cardiomyopathy and Other Cardiomyopathies, and Myocarditis: A Scientific Statement from the American Heart Association and American College of Cardiology. Circulation 2015;132:e273–80. Pelliccia A, Fagard R, Bjørnstad HH, et al. Recommendations for competitive sports participation in athletes with cardiovascular disease: a consensus document from the Study Group of Sports Cardiology of the Working Group of Cardiac Rehabilitation and Exercise Physiology and the Working Group of Mycardial and Pericardial Diseases of the European Society of Cardiology. Eur Heart J 2005;26:1422–5. Ho CY, López B, Coelho-Filho OR, et al. Myocardial fibrosis as an early manifestation of hypertrophic cardiomyopathy. N Engl J Med 2010;363:552–63. Ho CY, Abbasi SA, Neilan TG, et al. T1 measurements identify extracellular volume expansion in hypertrophic cardiomyopathy sarcomere mutation carriers with and without left ventricular hypertrophy. Circ Cardiovasc Imaging 2013;6:415–2. Jensen MK, Havndrup O, Christiansen M, et al. Penetrance of hypertrophic cardiomyopathy in children and adolescents: a 12-year follow-up study of clinical screening and predictive genetic testing. Circulation 2013;127:48–54.